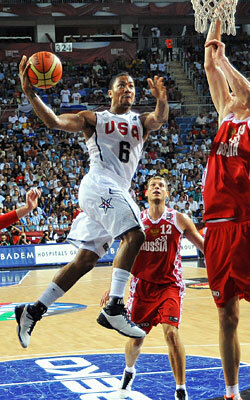 Well, Derrick Rose now officially is the golden child. That’s because the USA Basketball team Sunday won the gold medal and 2010 World Championship in Turkey, the U.S.’s first World Championship gold since 1994 and official entry to the 2012 Olympics in London. Rose wasn’t quite spectacular, averaging 7.2 points and coming in for some questioning after playing just 12 minutes in Saturday’s semifinal and shooting zero for four. I thought Rose was fine. He was supposed to be a ball distributor and led the team in assists. You can’t score 20 points on four shots. Playing with the Bulls, his role is different. I do agree he’s nowhere near being a three point shooter yet despite his pre tourney comments exuding confidence in long distance shooting. But his defense was better. He was fourth on the team in steals and his overall shooting was better than Chauncey Billups and Stephen Curry, tied with Eric Gordon and barely behind Russell Westbrook. It was Kevin Durant’s team and he was brilliant and showed he not only could carry a team but welcomed the opportunity. Yes, contrary to LeBron James. Not because James signed with Miami, but in international competition, James willingly stepped aside to allow Kobe Bryant, Dwyane Wade and Carmelo Anthony take responsibility. After watching James on USA Basketball teams, I felt he’d be a perfect fit with the Lakers if he wanted the best winning opportunity. He clearly relished being a supporting player, and now everyone knows it. He’ll likely play a form of point forward, like Scottie Pippen, for Miami, and Durant will likely be this season’s MVP. Though what I was most interested in for the gold medal game was the play of Omer Asik, the center for Turkey who is coming to the Bulls this season. Chris Dudley may be one possibility. Asik is big, a legitimate seven footer who has no offensive game. He is not a stiff, though. He’s somewhat athletic for his size, certainly no Aaron Gray or Dalibor Bagaric or Dragan Tarlac or Martynas Andriuskevicius or Luke Schenscher. Maybe a bit of Jake Voskuhl. Asik looked like he can catch a pick and roll pass and maybe a lob, though he’s no Joakim Noah. He’s such a bad free throw shooter he was accused in the semifinal game Saturday of faking injury late so he wouldn’t have to go to the line. But his form did not look horrible, or Shaq-like. I would expect he’d open the season as third string behind Kurt Thomas and then it would depend on how much he’ll advance. He should finally get some teaching. He seems to me to have a chance to help late in the season and in spot duty before then. I talked to Liliane Trevisan about him. She’s a friend who is one of the longest serving basketball journalists covering European teams. “He took basketball rather late (16 years old)). He’s an impressive defensive player with a capacity to move really quickly, good feet. He’s tough physically, but his offensive game is very raw, and he can’t shoot a free throw. In 2008, he tore his ACL and didn’t play for six months. “And this season, he broke his collarbone and didn’t play for two months. Then he went into a controversy with his team of Fenerbahce, which tried to make him sign a new contract and held him out of the team until he signed. Asik didn’t give in and sat out for the rest of the season. “Fortunately, he got an opportunity to play here (Istanbul) with the national team. He was averaging about nine points and seven rebounds (before the championship game, when he had five points and four rebounds). He’s a real team player, with good discipline, all dedicated to the team. “You can’t compare him to Tiago Splitter who’s much more skilled offensively. “Asik doesn’t have good hands and can hardly make a shot when he’s not close to the rim. That’s probably due to his late arrival in basketball, and the fact that, due to his size and body, and his abilities, his good timing in defense, his coaches in Turkey didn’t take the time to work and develop offensive moves. “Were he born Serbian, or Lithuanian, he’d be a lethal weapon today. But improvement of young players and plain fundamentals are not the brand of Turkish ball. He has a true understanding of the game, he’s willing to learn and listen, has a good work ethic and I think that with appropriate care and practice he can develop into a very surprising player. So, I think Asik will eventually break the Bulls losing streak of bad international backup bigs. I also think USA coach Mike Krzyzewski could have made it easier, though the team won and that’s the main job for the coach. So, well done K.
Particularly with so many top NBA international players, like Pau Gasol, Manu Ginonbili, Tony Parker, Joakim Noah and Mehmet Okur not participating, the NBA team, though mostly young and inexperienced in international ball, had a massive talent advantage. The U.S. was going with 12 NBA players while their opponents rarely had more than one or two. There isn’t really time with a team coming together in July to put in an offense. So I would liked to have seen Krzyzewski use all 12 players and play them in waves with substitutions every five or six minutes. Since it was mostly a team of young athletes, I would have had them pressure and trap constantly and then substitute regularly. It would have negated the zone use that hurt the USA team and left them to be exploited less by the pick and roll, which I haven’t seen a USA team defend for several of these such tournaments. So the team had to be bailed out with Durant averaging more than 30 the last three games, unheard of for U.S. players with the deep U.S. teams. It was the stuff of Oscar Schmidt. Krzyzewski fell into relying on a core of players, including Rose, who was third in minutes, a tenth behind Billups. They were mostly for defense and Durant for offense. Not my choice, but it worked and they won. And so we’ll see them next for the 2012 Olympics, and it will be interesting to see how many from the 2008 team choose to return. I suspect Rose will be part of that team as well, especially with two more years of experience, and here’s some post tournament comments from Rose courtesy of USA Basketball staff interviews. Bulls training camp begins in two weeks. The first preseason game in Milwaukee is in three weeks.